This Salvatore Ferragamo™ handbag is a perfect match for all of your flawless ensembles! Textured leather handbag with tonal stitching. Ferragamo engraved Vara bow on the front. Flap with push lock closure. Exterior features large centered slide pouch. Chain-link and leather crossbody shoulder strap. Genuine leather lined interior offers front wall slide pocket. 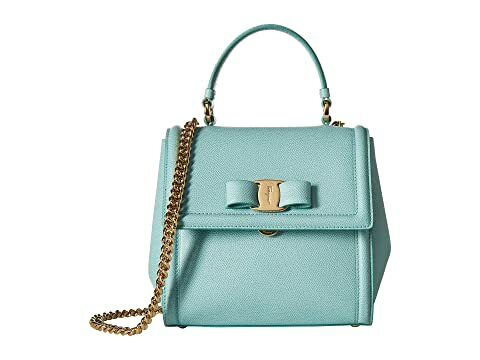 We can't currently find any similar items for the Small Carrie Satchel by Salvatore Ferragamo. Sorry!